through institutions such as the National Human Rights Commission (Komnas HAM) and ad hoc transitional justice mechanisms. However, the Indonesian Government has not shown a commitment to recognize the truth about widespread violence by state agents, or to prosecute perpetrators, prevent recurrence, and offer reparations to victims. Indonesia has yet to fully address its legacy of violations, while victims, their families, and civil society organizations face challenges to end impunity using a transitional justice framework, as outlined in this submission paper. 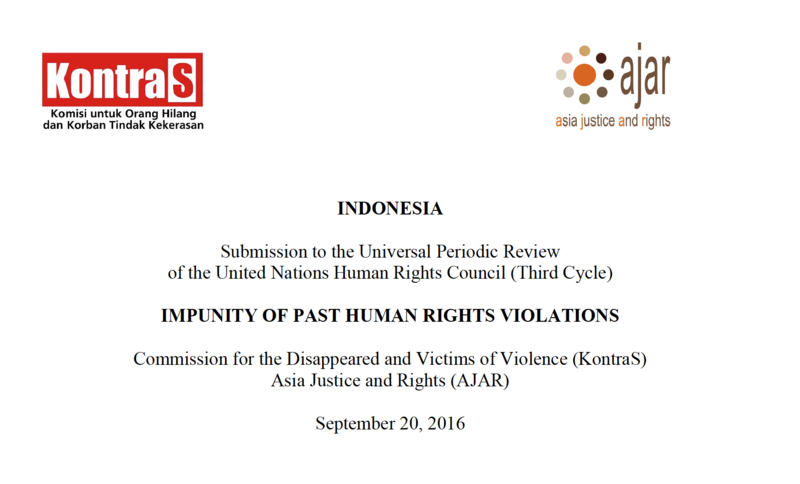 These two papers are submitted through the Universal Periodic Review on the United Nation On the Human Rights Council by AJAR and partnership with KontraS (Commission for the Disappeared and Victims of Violence).